So, what’s the connection? Recall Michael B Kelly’s concept of the walk back from Emmaus , the idea that as lesbigaytrans people in the Catholic church, we have a need, even an obligation, to walk away from the church – and hen to return , to confront the institutional leaders of the church with the reality of the risen Lord, and of his real message to the world. 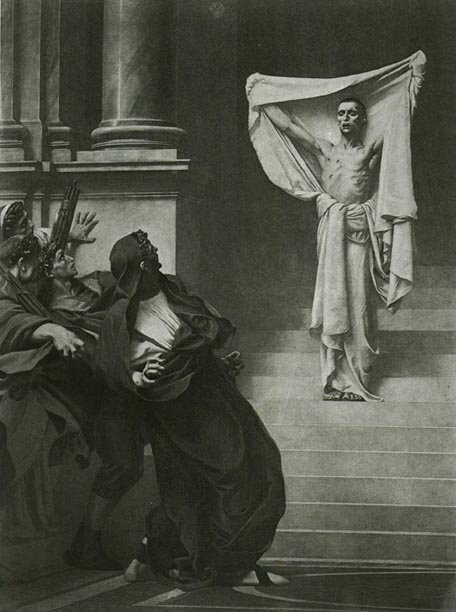 When I saw this image, I suddenly saw it as representing all queer people confronting the emperors of the church with the evidence of their attempted martyrdom. In spite of all the efforts of the ecclesiastical mechanism, through the misrepresentation of Scripture, the characterisation of us as “gravely “disordered, the active opposition in the political sphere to equal civic rights, and the failure to oppose criminalization, and hence the tacit support given to active bullying, violence and murder — not to mention actual execution by burning at the stake, in earlier years- we too, are not dead yet. 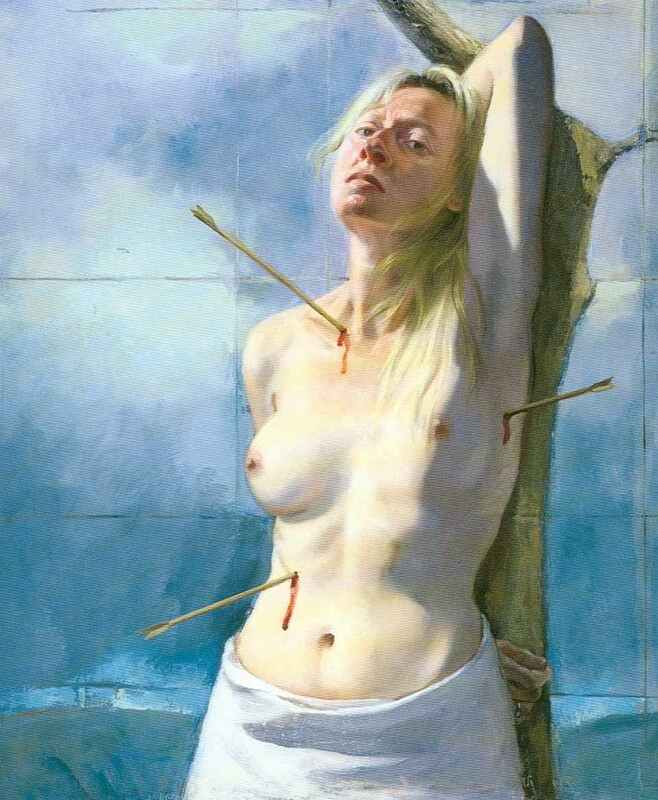 For a look at some of the extraordinary range of representations os Sebastian in art, just look at the results of a Google Image search, or go to “Iconography of Saint Sebastian (painting)”, which has an immense collection of links to art images, usefully arranged chronologically and by artist. I particularly like some of the images by 20th century artists, which seemed to me to go beyond the soppy sentimentality to something real and relevant. This one is startling – Sebastian as a self-portrait by a female artist. And why not?